Road Runner Girl: Is Running Worth It? As you know I've been dealing with some hip pain the last few weeks. I get this same hip pain every year around this time. I'm chalking it up to amping up training after taking it easy running all summer. Well I took a complete week off of running to let it rest (not something I wanted to do in the middle of training but I listened). After the week's rest the hip seemed to be getting better. It was still sore and tight on the days I ran but the next day there would be no pain at all. Well this week is taper week. My next half is next weekend. We are also going camping this weekend so I needed to find an alternate day to do my taper run. I ran Tuesday. I had a great run. The hip felt great until the last mile. Then I started to feel it. The rest of the day my hip was killing me! What did I do wrong? Did I push myself too hard on Tuesday's run? Did I run faster than I should have? I don't know! But I am soooo mad! Injuries are soooo frustrating! I am to the point where I'm thinking, "Is this running thing worth it?" Of course I know it is. I LOVE to run! But I just want to run pain free and injury free. I know next weekend's half marathon is just going to be for fun. There's no way I will be able to run for a PR. My friend Paige that is running this one with me has the EXACT same hip injury right now too! So we are just gonna have a good time with this one. I need this hip to get better soon though. I have so many races coming up that I have been looking forward to for so long! One of them is St. Jude Memphis which I've been fundraising for. And not to mention Disney in January! So that's what I'm going to do! I'm going to pray and try my hardest to not be discouraged! I'm not gonna quit! I'm going to believe that this hip pain will NOT last forever. I'm going to believe that I will be completely healed for all my other races. QOTD: Have you ever felt this way? 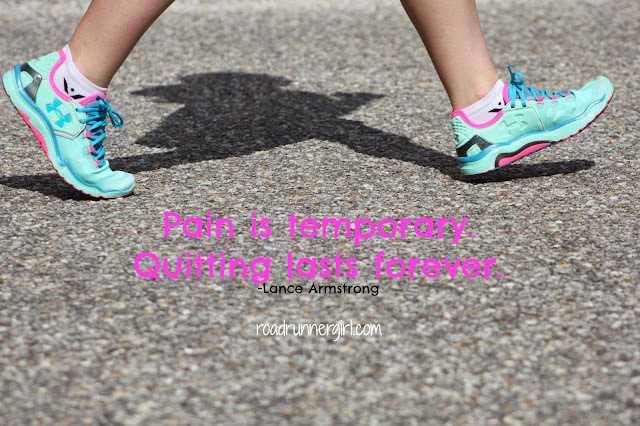 Have you ever wanted to quit running because of the injuries?